Network Rail has been criticised over "unsatisfactory" delays and disruption on the West Coast Main Line. 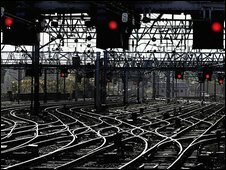 The Office of Rail Regulation said management was falling short and called for an improvement plan; Network Rail risks a fine if it fails to do this. More than one fifth of trains on the London-Glasgow line ran late last year. Network Rail said it had had a good year nationally, with 90.6% of trains arriving on time - the best figure since records began in 1992. A £9bn upgrade of the West Coast line was completed on time, but the ORR said its performance in recent months had been "volatile, and the problems are increasing". Officials also said more needed to be done to satisfy train companies' demands, branding Network Rail "bureaucratic and unresponsive". Chief executive Iain Coucher said train performance was at "an all-time high". Trains are considered to have arrived on time if they are within five minutes of their scheduled time on commuter routes and within 10 minutes on longer routes. "The railways have never been safer to travel on, millions of pounds are being saved from the cost of running the network and billions invested to make further improvements," Mr Coucher said. "Our strong focus on innovation and investment to improve our operations and reduce operating costs is driving our performance." In the last year, Network Rail said it had invested a record £4.7bn in the railways. It also claimed to have cut delays attributable to the company from 9.5 million minutes to 8.9 million minutes - the lowest level for more than a decade and beating the ORR target. There were 4% efficiency gains, it insisted, but the ORR said it had failed to meet targets for efficiency savings. Mr Coucher said: "We have had a good year overall and there is always room for improvement. I am acutely aware that customers expect and deserve an ever-improving rail service." The company saw its annual profit fall and debt level increase in 2008-9. Meanwhile, net debt rose to £22.3bn from £19.7bn.